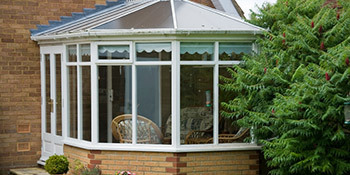 As a financial investment, conservatories are one of the best home improvements you can make. As an extension to the back of your property you’ll add extra space and light. On top of this, conservatories add over £9,000 to the value of your home, so you’ll easily make the installation costs back in the sale of your home. And until that date you’ll have an aesthetically pleasing room to enjoy the garden with. Choose from a range of designs and styles, from the traditional Victorian and Georgian, to the modern bespoke and lean-to. For a conservatory you want something that’s strong and durable. Aluminium offers this and more, being by far the most resistant material you can use. It will be able to withstand strong wind loads and heavy impacts, ensuring it lasts well for years and you won’t have large amounts of maintenance to carry out. There are also a number of colours to choose from, so you can easily find something that matches your home, or set your aluminium conservatory apart from the crowd. Aluminium conservatories provide homes with sophistication and durability, adding value to your property. If you’re interested in creating extra room just complete our quick form and we’ll provide you with up to four FREE quotes from local, vetted and reputable trade professionals. You’ll be able to compare conservatory prices and ensure you receive the right deal.